This is made with wholemeal spelt flour and has a lovely nutty flavour. make batter as usual. Mix all dry ingredients, add eggs then liquid to a soft dough. run through any spaetzle maker into a pot of boiling water. Simmer for 5 mins. ***this flour is a lot firmer than normal spaetzle. butter to fry, half a cup cream for sauce. Saute onions until golden. 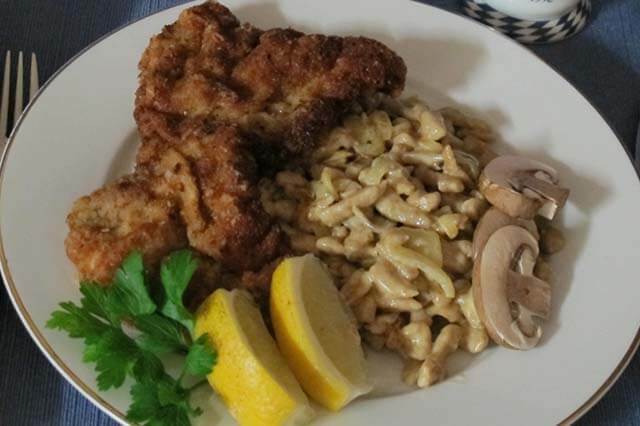 Add spaetzle and saute for several minutes on medium heat. add mushrooms to the side and fold through. cook for 2 minutes and add cream, salt and pepper, chicken stock powder and sprinkle of parmesan cheese. Cook on low heat as this will bring the flavours through. Serve with schnitzel and garnish.